Risqué Designs is a Filipino homegrown brand that hand-crafts products made of various indigenous materials. It is owned and managed by Tal de Guzman, an Art Management graduate of Ateneo de Manila University, who later on took Fashion Design and Entrepreneurship courses. In 2012, de Guzman envisioned a business where she can incorporate Filipino culture into fashion products like bags. But, realizing that the space for innovation in the bag industry is already held by numerous companies, she then decided to venture into the customized Filipino-inspired shoe business. Though it’s difficult to strive and keep going especially in the shoe industry, she was able to succeed through igniting the fire of passion especially to her partner shoe-makers in Marikina—known as the Shoe Capital of the Philippines. “With shoes, you have to consider so many sizes, the height, the comfort, and the shape of each pair. 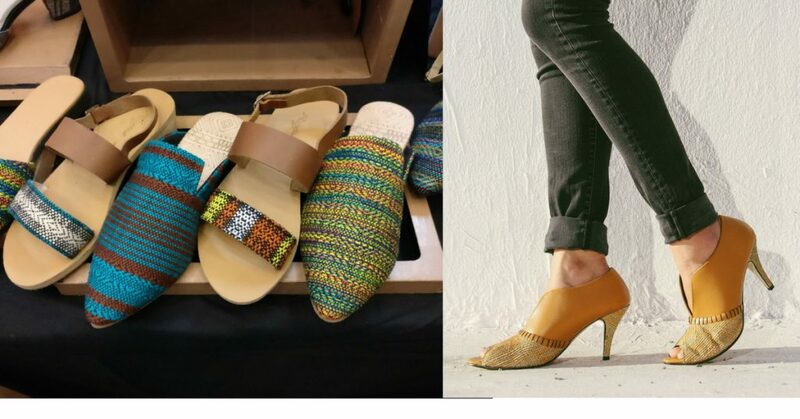 It’s hard to go into shoe-making, more so into customizing shoes, and even more so to use materials from different parts of the country,” she said to Gutsy. Tal de Guzman encourages aspiring entrepreneurs to be proud of their own roots and to make use of what the Philippines has to offer. Risqué mixes various Filipino materials, craftsmanship, and inspirations to create ready-to-wear footwear pieces. The brand’s goal is to utilize Filipino local materials in order to transform ordinary footwear into unique ones. By using indigenous materials, Risqué became an iconic brand of Filipino culture and creativity, since the patterns designed are very Filipino. Risqué also aims to share stories of traditional Filipino designs grounded by the creative skills of local workers. 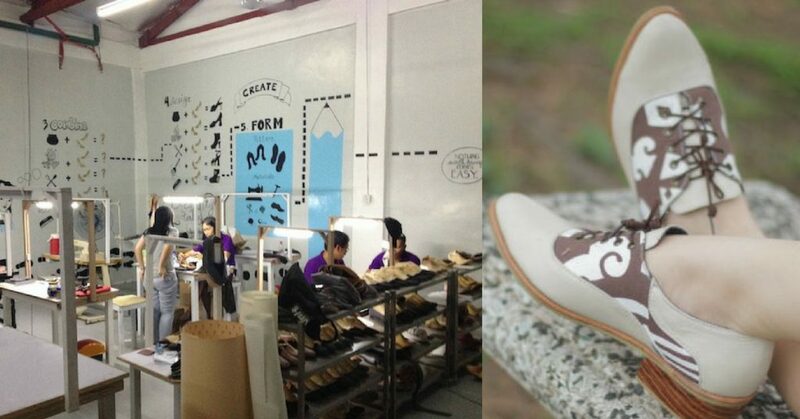 Now, the brand continues to evolve creating modern and even customized footwear pieces. De Guzman said they combine and modernize wood carvings and hablon by experimenting on their color combinations. The materials used in manufacturing come from all around the Philippines. They get these from places such as Cebu, Abra, Baguio, and Negros. “If I’m decided on a certain material or a community, I spend time with the weavers. I recently gave the community in Negros new looms. I’m focused on increasing the usage of these materials,” she said to 2ndOpinion. Risqué also offers custom-made shoes for buyers using the old-fashioned way of measuring and drawing the shape of the foot. The carvings and heels of the shoes are crafted by three different teams. The carving is done by the traditional carvers of Paete, Laguna, while the hablon weaves are spun by a team in Valladolid, Negros Occidental. And finally, the products are assembled and finished by artisans in Marikina City. These skilled artists have been in the shoe-making industry for more than 30 years but are not compensated by big companies that buy their shoes. Local artisans in Marikina are usually paid by companies per piece making them earn only around PHP 1,500 a week or sometimes even lesser. And so, de Guzman decided to step up and bring back the lost appreciation for these shoe-makers of Marikina. She paid them at a daily rate for a standard eight hours of work per day, and give them an extra pay when they work overtime. She also buys yards of weaves from Negros and pays more than the initial price because she values the work they put into making these traditional weaves. Since 2013, Risqué has consistently been exhibiting in Manila FAME International and has also participated in the New York NOW Trade Fair in New York in 2015. Risqué has its own 180 square meter production factory and showroom in Marikina. It also recently opened its store in Glorietta Mall, Makati. And although she designs most of the shoes, she also collaborates with other designers and interns. “I had some young designers collaborate with me. Some arrangements involve their getting a percentage of sales from their designs,” she said to Inquirer.net. Last July 2016, the brand launched the newest collection, Amansinaya. It is a collection in collaboration with Tessa Prieto-Valdes, who is known to be the “Sea Princess”, because of her unique and remarkable way of dressing herself. De Guzman drew her inspiration from the Philippine marine life. The collection features heels that are designed after starfish and yellow and blue hablon inspired by a tropical fish. And despite the success they have achieved, Risqué Designs is still clear on what their advocacy is—to be loyal to the Filipinos and make each pair of footwear uphold the dignity of the many hands that made it.